Some of my favorite vintage jewelry pieces are those that combine glass with rhinestones. I'm not a person who likes over the top rhinestone jewelry - just a simple design with an accent rhinestone or two appeals to me. But I do love glass. The coolness and weight of the beads just feels right to me when worn. Add to that the fact that glass vintage jewelry is so undervalued, compared to other vintage jewelry stones, and it is the perfect medium for a reasonably priced addition to your jewelry collection. So, this lovely pair of earrings is right up my alley. It has a pink chaton rhinestone and a long navette stone in a paler shade of pink, as well as a cluster of heavily faceted bright pink beads. I think the look is just spectacular and they would look so well for both daytime and evening wear. The earrings have clip backs and are 1 x 7/8" in size. 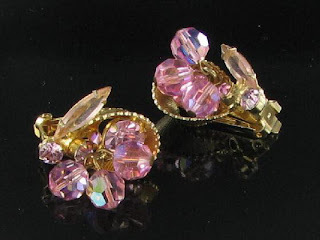 These pretty pink rhinestone and glass earrings are available from my Vintage Jewelry Lane Site for only $23.99. Does glass jewelry appeal to you as well, or are you a fan of jewelry that features more rhinestones in the design? I don’t know If I said it already but …I’m so glad I found this site…Keep up the good work I read a lot of blogs on a daily basis and for the most part, people lack substance but, I just wanted to make a quick comment to say great blog. Thanks! Thank you so much for the kind comments. I do my best! How did your love for vintage jewelry start?